Sumayya shares one of her favourite family recipes for a traditional Pakistani fish curry, utilising the tangy flavour of pickles, or 'achar'. Any firm white fish may be used, although Sumaya recommends halibut or hake. Growing up in a coastal city, I was blessed with the seawater treasures of the Arabian Sea and the freshwater fish from the beautiful River Indus, which is steeped in the history of the Indus Valley civilization – one of the oldest civilizations of the old world. Fishing is one of the main livelihoods of the coastal people. We are lucky enough to source juicy jumbo prawns, crabs, lobster and some regional fish like pomfert and barracuda from the Arabian Sea and pallah fish from the rivers in Hyderabad. When most people think of Pakistani food, they usually think of meat-based dishes, but we have a surprisingly rich seafood cuisine, with recipes that are unique and different to Indian seafood dishes. Lahori fried fish is a local street food delicacy that is coated with a delicious batter and fried. Spicy prawn karahi’s are another local delicacy. My best memories are of crabbing trips to Karachi port, where you head out on a boat to catch crabs, which are then prepared for you in a delicious red chilli, cumin and lemon-based masala. Here, I share with you a fish curry recipe that I grew up with at home. This recipe is born from the love of pickle or ‘achar’, as it’s called in Urdu and is condiment that few Pakistani dining tables would be without. We would go to the fish bazaar in the morning and the fish – that had only just arrived from the fisheries – would be on our plates within a few hours – that’s the beauty of living by a coastal town! 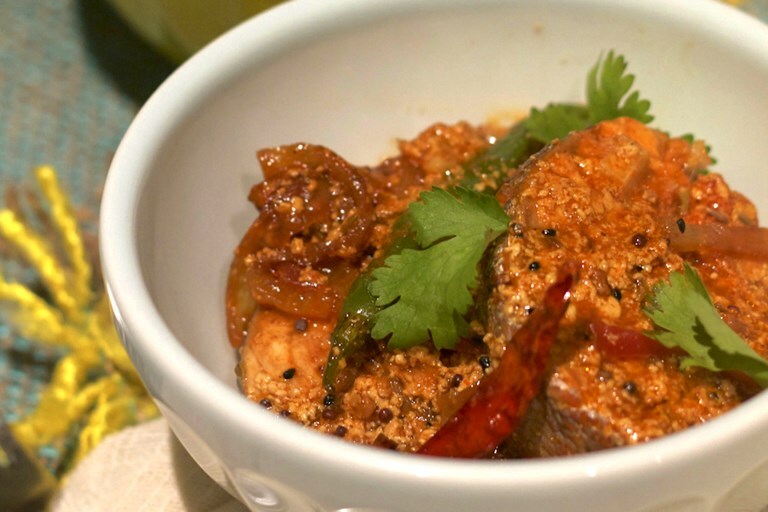 This is a dish that brings those achar flavours into a fish curry. It is best made with a solid white fish like halibut or hake, as white fish allows the achar flavours to be infused into the fish, creating a thick and warming curry.